When Akamai was laying the foundation for its digital business back in 2010, CMO Brad Rinklin had a relationship with IT, but it wasn't exclusive. Because the content delivery network provider had no CIO, Rinklin might call on IT for help tweaking a website or deploying a sales-enablement tool, but the marketing group often turned to cloud tools or outside service providers for the heavy lifting. As Akamai's marketing initiatives surged, so did Rinklin's frustration. The IT department, resource constrained and spread way too thin, took forever to get anything done, he says, and it focused on technology, not the business. "They approached things as a true technology project -- like how to make connectivity or APIs work, not really thinking of the business impact and the importance of what we were trying to do," Rinklin recalls. All of that changed in 2011 when Akamai brought on its first-ever CIO, Kumud Kalia, who got right to work with Rinklin to align marketing and IT and to co-captain Akamai's digital future. "It was like pushing on an open door -- they were ready for help," Kalia says. "They were shifting toward digital marketing for many years, but often in reactive mode to seize a market opportunity because they couldn't wait for IT to deliver. They just needed to execute." With customer experience and digital business among today's top business imperatives, lots of companies are ratcheting up technology investments to execute new marketing strategies. In Computerworld's Forecast 2016 survey on IT priorities, 13 percent of the respondents identified marketing technology as a new area of spending. Moreover, 16 percent cited improving customer satisfaction/experience as a primary objective, putting that goal at No. 4 on a list of spending priorities, up from last place a year earlier. CIO.com's 2016 State of the CIO research revealed a similar emphasis on technology for marketing: Thirty-three percent of the respondents said marketing had a budget to fund technology investments this year, and 32 percent said the same would be true over the next three years. "Customer experience is becoming a hot button -- not just for the CMO, but across the C-suite," says Sheryl Pattek, an analyst at Forrester Research. "Customers expect a consistent experience and they expect a company to know who they are from device to device and from touch point to touch point. You can only do that with technology." If customer experience and technology go hand in hand, then IT and marketing will need to work much more closely together in the years to come, as will the CIO and the CMO. 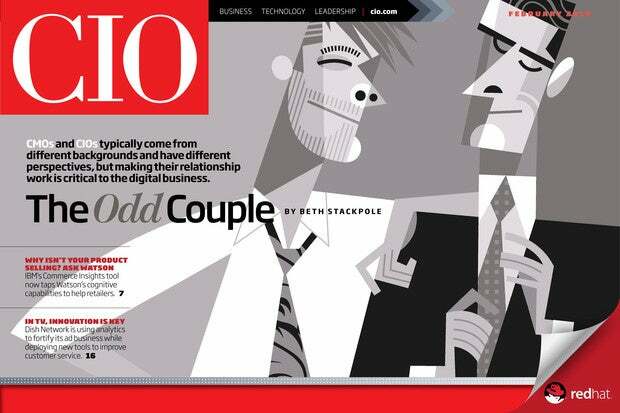 To date, the latter relationship has not been characterized as overly chummy, but CIO.com's 2016 State of the CIO research found signs of a warming trend: 49 percent of the respondents said the CMO-CIO relationship has become much or somewhat closer and more collaborative in the past three years, while 43 percent said it has remained the same. While both sides recognize the need for alignment and a joint strategic plan, there remains a disconnect in how each party views its contribution, according to a November 2014 Forrester report on CMO-CIO collaboration. For example, the research, spearheaded by Pattek, found that while about 70 percent of the executives in both groups believe their strategic planning process emphasizes enhancing customer acquisition, retention and loyalty, only 61 percent of marketers think the CIO is actively engaged in that process. In contrast, 76 percent of the IT leaders said the CIO plays an active role. In addition, 70 percent of marketers and 66 percent of tech management executives said they agree that marketing technology plans will gain more support and funding if they're developed jointly by the CMO and CIO. However, only 51 percent of the respondents said that the two parties are in fact working together to select and deploy marketing technologies at their organizations. More often, CMOs, like Akamai's Rinklin, work with outside tech partners or use hosted marketing applications, only to find that, far from making things easier, such shadow IT efforts backfire, Pattek says. "All of a sudden, they wake up and have all these point pieces that don't integrate and don't provide a consistent experience," she says. "They need help and turn to the CIO." At Akamai, Rinklin welcomed Kalia's arrival; he was eager to have a strategic partner to help map out the company's digital business transformation. By applying cross-functional governance principles and jointly sponsoring key initiatives, the two were able to successfully co-pilot sweeping changes to Akamai's culture that brought their two groups closer together. They talk every day and have assigned an IT leader to marketing. That liaison is held accountable for the goals established for each marketing initiative and Kalia says the position's compensation is tied to core business objectives. Akamai's IT group is about 400 strong globally, with a dozen people dedicated to serving Rinklin's 150 marketers. Now in place for a couple of years, the IT-marketing alignment has been a huge success, allowing Akamai to pull off a major technology coup in a relatively short time period -- something that would have been impossible in years past, Rinklin says. "Considering we're a $2 billion company, Kumud's team helped marketing launch a brand-new website with a brand-new [content management system] and a brand-new marketing automation system while overhauling all of our marketing lead processes and doing an integration into our Salesforce automation engine," Rinklin says, adding that all those projects were done in one calendar year and there was no downtime. "Overnight, we went from our old system to our new system and it all worked fantastically," he says. "We couldn't have done that as a marketing team alone or just asking for some IT help. We had to do this as a partnership." At SAS Institute, a provider of data analytics and business intelligence software, alignment between marketing and IT is crucial to the company's goal of delivering a "frictionless" experience to engage the customer, says executive vice president and CIO Keith Collins. It's not about a specific social media, marketing automation or call center strategy, he says. Rather, it's about having all areas of the business work together to eliminate friction with the customer to make the experience shine. Melding core systems so marketers can analyze data for actionable insights into the behavior and buying habits of their customers is where IT-marketing alignment pays off. In the Forrester study on CMO-CIO collaboration, three-quarters of both marketing and tech management leaders said they place a priority on customer intelligence, yet only 46 percent of the marketers and 51 percent of the tech leaders said they feel confident that they had achieved a single view of the customer across all relevant touch points throughout the customer life cycle. "That's why we're seeing a shift in investments and across business units about the idea of working together," Collins says. "With shadow IT efforts, marketing looks at their slice of what they do with the customer, but they have no holistic viewpoint. IT works with each of the different units and has the opportunity and responsibility to create a more holistic view of the customer as well as integrated business processes." To promote alignment and cross-departmental collaboration, Collins and his CMO counterpart meet regularly with other marketing and IT leaders, along with representatives from the legal department, to keep SAS on its course for digital transformation. Collins says it's important to foster alignment not just within the leadership team, but among the rank and file too. To do that, he and the CMO nurture teams of IT and marketing staffers, engage in cross-functional project management practices, and jointly apply agile processes to keep projects moving. "It's important that the relationship between CIO and CMO is great, but what's even more important is that the relationship of the team executing the plan is great," Collins says. A handful of organizations have taken CMO-CIO alignment to the extreme and made one executive responsible for both functions. Michael Burroughs, whose background is in operations, has held that singular role at a couple of organizations, most recently at an online purveyor of health-related products. Promoted recently to vice president of digital marketing and information, Burroughs says the combined role makes the most sense for companies that are invested in doing all they can to leverage customer data. "The type of industry or company that has a desire to know everything they can possibly know about the customer... is the sweet spot for this particular role," he says. "You're looking for data that can be the difference between 10 percent growth and staying flat, and it's not always obvious. The ability to sift through that data requires strength on the marketing and technology sides, and if the technology team is isolated from the process, failure is likely." Beyond creating a shared CIO/CMO role, there are plenty of steps companies can take to nurture the bond between IT and marketing. Forrester's Pattek says she has seen some companies switch up their CMOs and CIOs periodically, which helps IT learn to sell itself internally, gain a customer-experience point of view, and learn the business while helping marketing get more tech-savvy. Colocating IT and marketing teams and assigning an IT business analyst to the marketing leadership team helps with alignment and ensures that both functions are represented on project teams. Finally, simple things like joint lunches and cross-training seminars can help bridge long-standing divides, she says. "Everything needs to be done jointly as opposed to being done in parallel like in the past," Pattek says. "It really comes down to changing the culture of the organization from being siloed to being more focused on the customer."